This is a lovely example of how you can use a cluster of smaller diamonds to create a real sparkle! Here, 14 round brilliant cut diamonds have been hand set in a halo style to create the dramatic, sparkling effect. All the diamonds are of matching colour and clarity to ensure a flawless finish. The diamond cluster sits within a neat, contained head which gives the ring a lovely, tactile finish. The band of the ring is also fulsome and curved. This complements the design beautifully. A stunning and sparkling bespoke engagement ring! A bespoke diamond rose engagement ring cast in white gold. 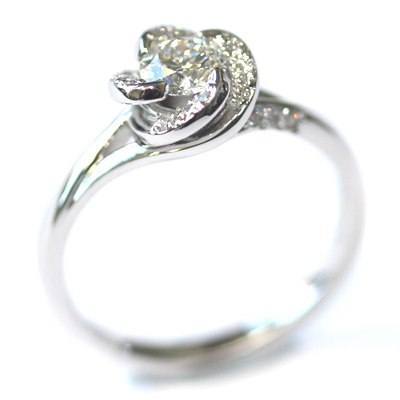 The customer came to us with a beautiful rose design that they wanted to be encrusted with diamonds. At the centre of this cluster engagement ring is a bold round brilliant cut diamond. Then, on the sweeping “petals”, more smaller round brilliant cut diamonds have been grain set. Whilst also being a neat setting, grain setting is highly polished to give extra sparkle too. Finally, down the split shoulders of the ring, are additional diamonds. All the diamonds across the engagement ring are of matching colour and clarity. This ensures a flawless finish. 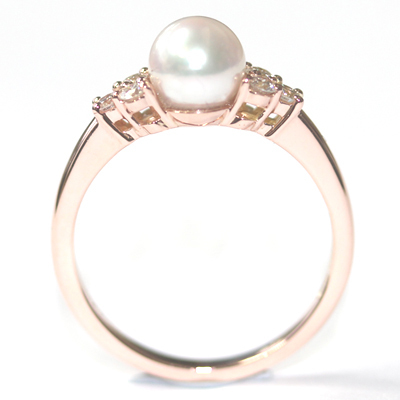 A pretty rose gold pearl and diamond engagement ring. 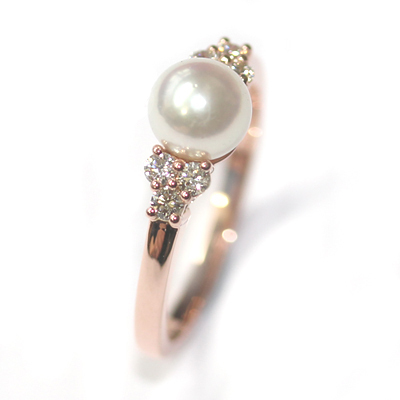 At the heart of this bespoke engagement ring is a lovely Akoya pearl. Then, a trilogy of diamonds is hand-set either side of the pearl creating a beautiful frame. All the diamonds are of matching clarity and colour, ensuring a pristine sparkle. 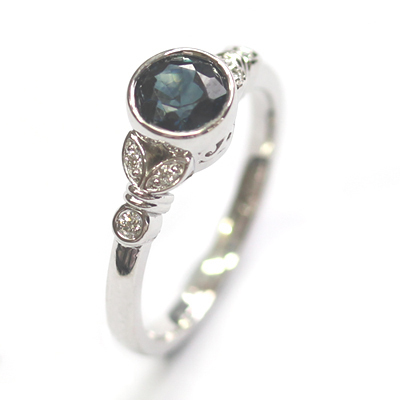 Adding to the pretty nature of this engagement ring is the delicate basket that all the stones sit in. Cast in 9ct rose gold, the basket and shank of the ring complement the tone of the dainty cluster. A bespoke and beautiful rose gold engagement ring. The customer also returned to us for their Rose Gold Fitted Wedding Ring. 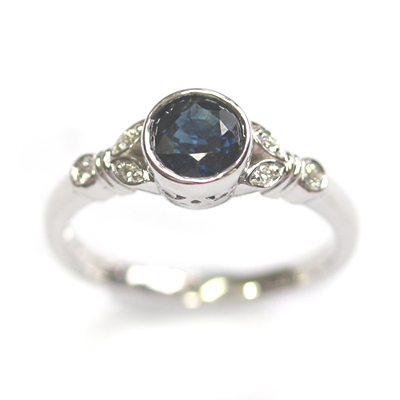 An antique style engagement ring with a bold sapphire and diamonds. 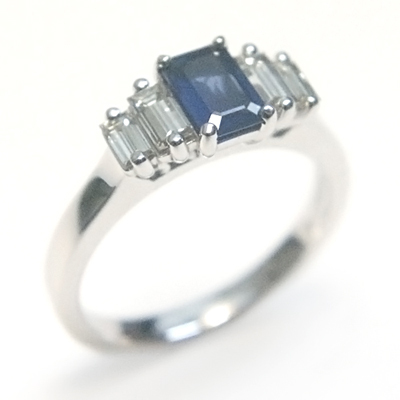 At the centre of this bespoke engagement ring is a dark blue, round brilliant cut sapphire. It is rub set into a pretty basket which has filigree-like detailing around the bottom edge. 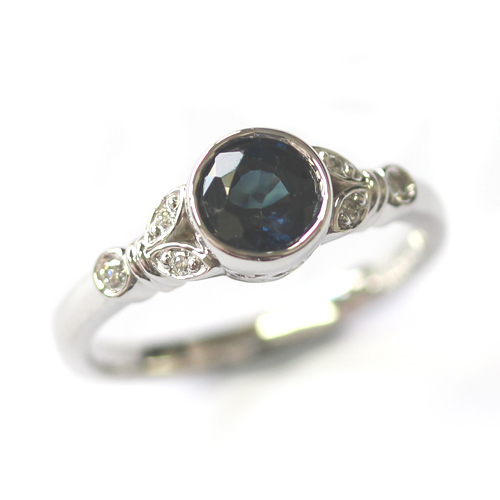 Flanking the sapphire is more dainty antique-style details. 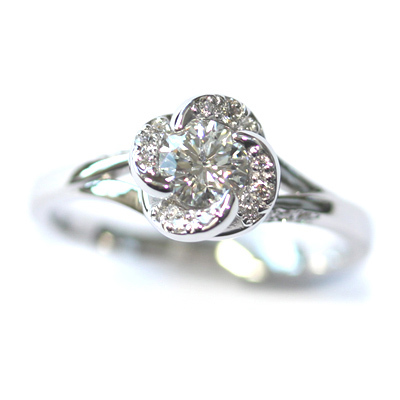 Double leaf shaped settings hold petite round brilliant cut diamonds. Then follows a double rope detail and another rub set round brilliant cut diamond. 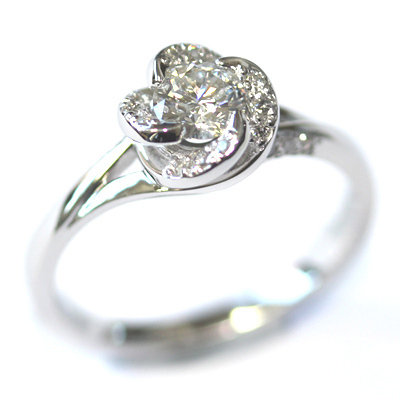 A beautiful, bespoke, white gold engagement ring. A bespoke white gold sapphire and diamond engagement ring. 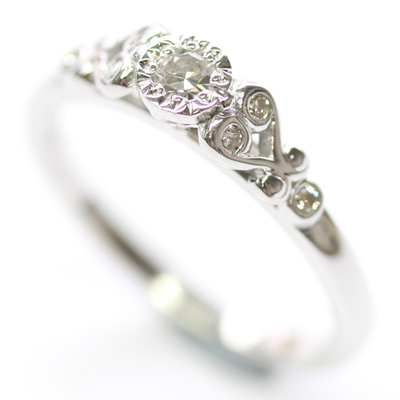 The customer came to us looking for an elegant multi-stone ring. Our expert jewellers here at Form Bespoke Jewellers sourced a selection of coloured stones and diamonds for the customer to view. 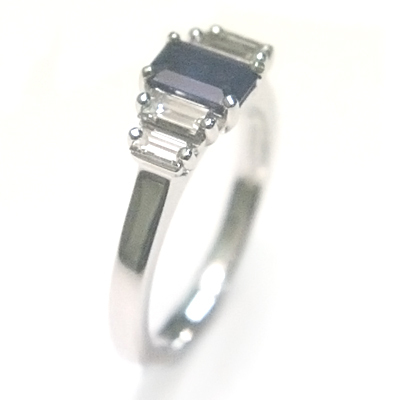 This is a special service that we offer as a bespoke jewellers which allows you to choose your perfect precious stones. By being able to see stones in a variety of different cuts, colours and clarity, it allows you to make a fully informed and personal choice for your bespoke design. 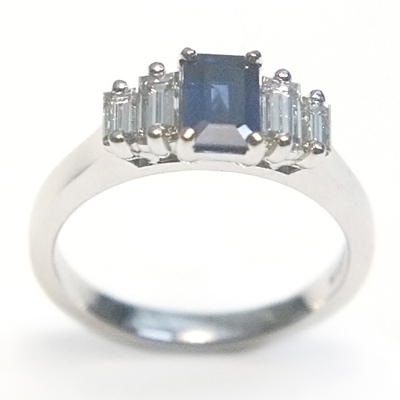 In this case, an emerald cut dark blue sapphire was chosen to be set at the centre of the engagement ring. Two baguette cut diamonds flank the sapphire on each side. All the diamonds are of matching colour and clarity but graduate in size. This beautiful engagement ring was cast in 18 carat white gold and was hand set, finished and polished in our Yorkshire workshop. 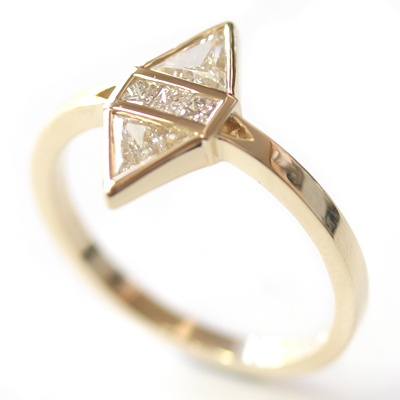 A bespoke yellow gold engagement ring with trillion and princess cut diamonds. 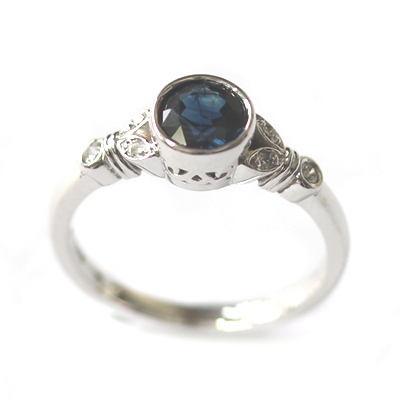 A cluster engagement ring with a cool, bohemian theme. The customer came to us with a clear idea of what he wanted his bespoke engagement ring to look like. Alongside the guidance of our expert jewellers, a CAD image was created of his bespoke design. Then, once approved by the customer, the CAD file was sent to the casters for the ring to be cast in the yellow gold. On it’s return to us, the two trillion cut diamonds and three princess cut diamonds were hand set into the engagement ring. The neat, rub setting, allows for the ring to have a lovely tactile finish whilst also reflecting the bohemian style beautifully. There are also petite cut-outs in the shoulders of the ring for an additional, pretty detail. One of the benefits of being a bespoke jewellers is that we have the ability to bring a customer’s bespoke design to life. And the customer was thrilled with their bespoke engagement ring. The customer also returned to us for a bespoke 14ct White Gold Plain Fitted Wedding Ring. A bespoke white gold scroll engagement ring with the customer’s diamonds. We used a selection of diamonds provided by the customer to create this beautiful engagement ring. 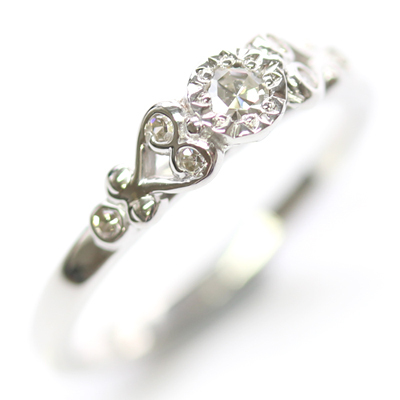 Two diamonds sit within each scrolling heart and then another diamond rests underneath on the shoulders of the ring. The centre diamond has been hand set into a bold, engraved setting where the undulating metal creates an illusion of extra sparkle. All the diamonds are round brilliant cut and have been rub set by hand. We love this bespoke scroll design. It was developed by the customer alongside our expert jewellers. Using our CAD software, we were able to bring the customer’s initial ideas to life in 3D virtual images. Only once the customer was happy with the design did we then send the images off to the casters for the ring to be cast in bright white gold. We think the white gold compliments the diamonds beautifully.